DBF Viewer 2000 allows you create DBF files (dBase III/VI, Foxpro, Visual Foxpro) on the fly. To create a new DBF file, open File | New menu. 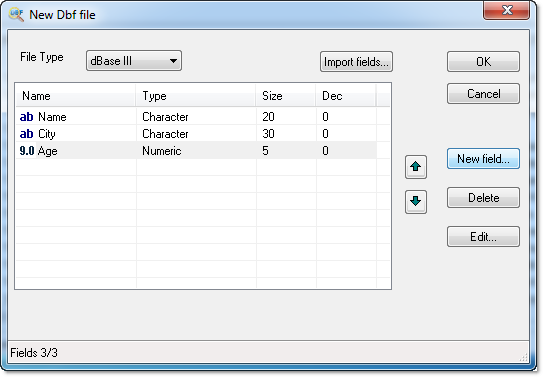 New DBF file dialog box opens. To add a new field, click the New field button and fill in Field, Type, Size, and Digits. To delete the field, click "Delete". To Import/Append fields from other DBF file, click "Import". Select the type of the file in File Type drop-down list below.